When you first look at these, I am hoping that you think “wow, what a creative way of displaying mini grilled cheese sandwiches!” I’m sure your mind quickly drifts away from that thought to try to figure out what the red, thick, sauce it is served with is? Can it be marinara sauce? No. Spaghetti Sauce? No, try again. It is good old Tomato Soup. Yes, my friends, there is a first for everything, and this validates the fact that I did not know how to make tomato soup before this past weekend! We had a few people over on Saturday and since I have been increasingly more and more addicted to pinterest (thank you, mom,) I thought I would try out some of the DIY party appetizers. I was inspired by Because Im Addicted who has various trends, whether it be fashion, food or photography. 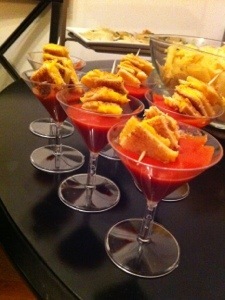 I loved the idea of making mini grilled cheese sandwiches and placing them over tomato soup! I had always been more of a “Grilled cheese with tomato” girl, instead of the soup part, but I figured they go hand in hand, and they sure look cute so why not give it a whirl! Wrong!! As my entire can of tomato soup was quickly running out after only filling about five mini martini glasses, I did think to myself that was odd. However, continued to arrange everything and place it out in the dining room so our guests could start to enjoy! It was a few minutes later than my sister asked me why the tomato soup was so thick, and asked how much water or milk I added. Ummm, none? I didn’t even think to read the can for instructions! I mean how hard could it be to make a can of tomato soup? You have to ADD ingredients? Oops! Luckily, Christy saved the day and made the next round of soup, adding milk, and it was then a big hit. Thank you, Christy for saving the day!